Writers want to write. But writing is about communicating. So it’s not a matter of “writing vs. marketing” it’s a matter of writing and marketing. I’ve been learning the hard way that if writing a book is about having something to say, then having an audience for it is about finding people to say it to. The second half of the equation is, in a word, marketing. You see: Writing is about the passionate desire to communicate something. But communication is about the flow of ideas to someone. Without someone at the other end, no communication occurs! So writing is only half the task. The other half is getting it into the hands of readers. Marketing is about the passionate to find people to communicate to, and initiating the conversation. It’s about identifying a receptive audience, reaching them, and getting them intrigued by what you have to say. To illustrate the importance of marketing, consider the horrible news displayed in the online article, How Much Do Writers Earn? Less Than You Think! 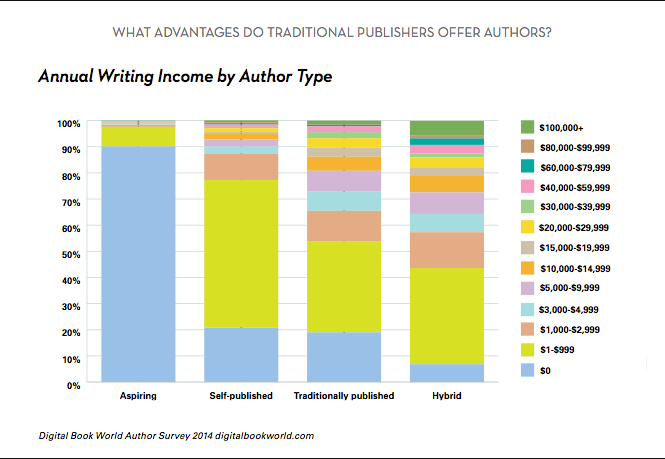 As shown in the graph, 50-75% of authors make less than $1,000 a year! Those making $100,000 or more represent a tiny sliver at the top of the heap — 1-2%! Making as little as $10,000 year puts you in the top 20% of traditionally published authors, and in the top sliver of self-published authors. Now, sales figures are just a number. But they represent how many people are reading — in other words, how much actual communication is happening! So if we think about all those famous authors selling huge volumes of books, we have to put it down first to quality, and second to marketing. It is the combination of both that made them famous, not one or the other. A foreword from someone famous, blazoned across the title page. The ability to giving talks and engage others (for example, in an interview) combined with the marketing activities needed to create opportunities for them.